Ever since my girl Gina over at Skinnytaste posted these watermelon pizzas, I knew I wanted to do something fun with watermelon too. And if you’re like me, I always end up with wasted watermelon in the refrigerator, because it’s impossible to eat a whole watermelon quickly enough! This is your solution! If you are using a full watermelon, just follow the recipe and then cube the leftovers and save them in the refrigerator – or make them into popsicles, watermelon margaritas, or whatever! 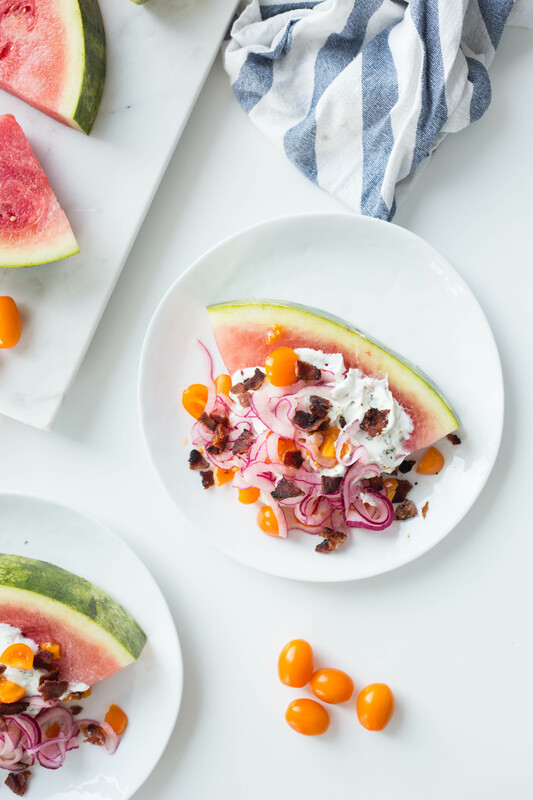 Watermelon is so refreshing and healthy in the summertime, there’s no shortage of reasons to use it up. 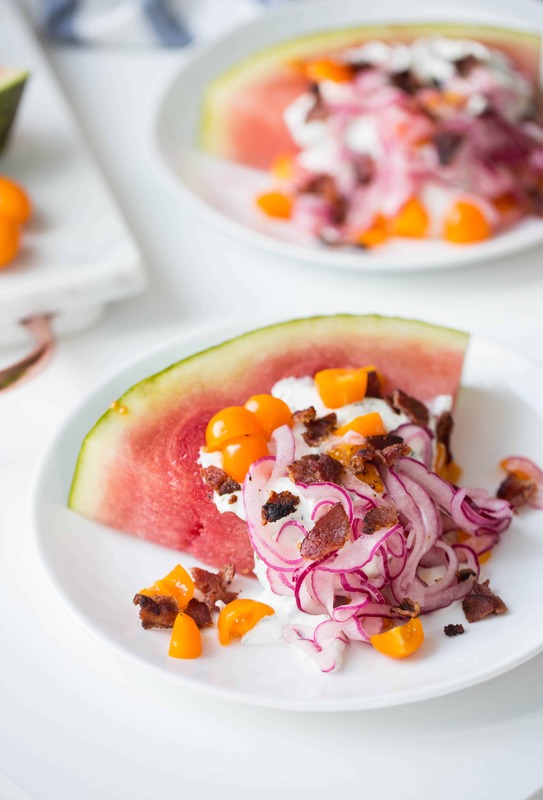 This Greek yogurt ranch is much lighter and gives a healthy burst of protein and calcium to this salad and adds a creamy, tart kick to each fresh bite of watermelon. The quick-pickled onions are super easy to make and they’re my favorite to top on salads, burgers, and especially avocado toast. You can keep them in the refrigerator for 3-5 days and they’ll maintain their freshness, so go ahead and make a big batch and save it up! They’re pickled with apple cider vinegar, salt, and honey. You’ll impress your friends, guests, and loved ones with these wedge salads! After all, Inspiralized is all about thinking outside the box and eating healthfully and creatively, right? In a medium bowl, whisk together the apple cider vinegar, honey, and salt. Add the onions, toss and set aside. Toss the onions every 5 minutes as you continue with the recipe. Place a large skillet over medium-high heat. Add in the bacon slices and let cook for 5 minutes or until very crispy. Transfer to a paper towel lined plate. Crumble the bacon into bacon bits. In a medium bowl, combine the Greek yogurt, oil, lemon juice, parsley, dill weed, garlic powder, onion powder, dried onion, black pepper, chives and salt. Mix together well. 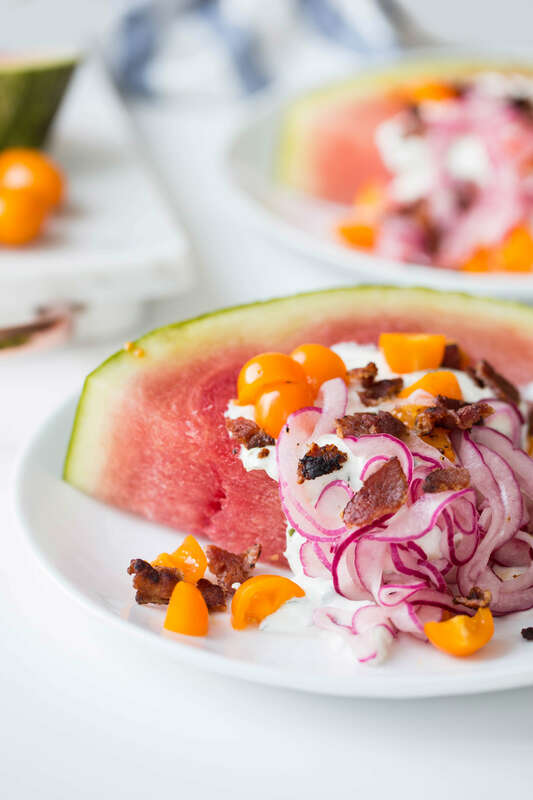 Place a watermelon wedge on a plate. Top with a dollop of the yogurt ranch. Top with bacon bits, tomatoes, and pickled onions. YUM can't wait to try out this Greek ranch... I'm obsessed with ranch dressing but it's so unhealthy and this looks like an amazing swap! I have recently purchased the spiralize her from HSN and gave it five stars. I find I have to amend that rating due to the absolutely awful suctioning (or lack thereof). I thought I'd gotten the gang of it, but after 1-3 turns it has to be reset. And, to get it to work beyond one turn, one must push really, really hard on the top front and top back of the unit. 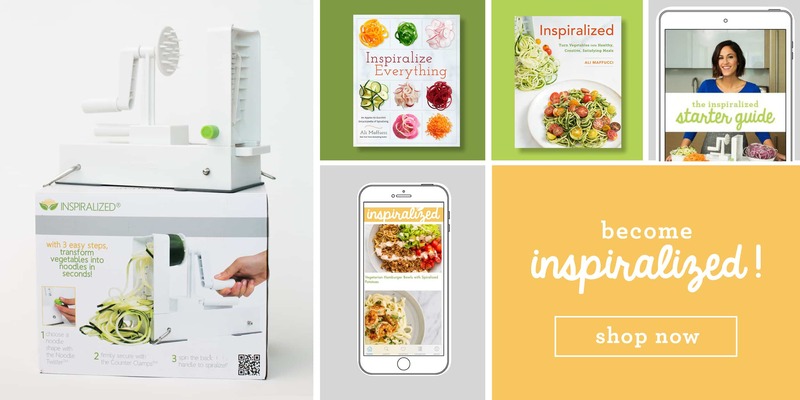 Have ordered next brand of spiralizer and hope I'm more in-spired.